this blog has moved to a different home. While our super Nicola is sadly going back to Europe, he's been handing on the baton to our new young team member: Claudine Rollandin! Fear not. Despite all, she’s 100% Italian (although she does pronounce her name with a sharp French accent...). 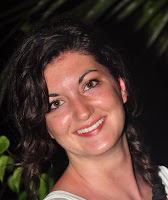 As Nicola, Claudine got here through the 'Master dei talent neolaureati' program held by the CRT Foundation. That is, a life-changing opportunity for the best graduates. She’s currently a student at the Polytechnic University of Turin where she’s doing a Master in Industrial Production and Technological Innovation Engineering. She grew up in Aosta Valley too (!). We figured that being accostumed to the Alps weather makes it easier to survive to the San Franciscan summer! In the last few years though, she hasn’t spent much time skiing, since she was in high school she studied in Australia, Barcelona and this last year in Paris (bien sur) where she was following a Double Degree program in Finance (can't get enough). She has now started this new adventure in San Francisco where she’ll be helping us for one whole year coordinating the GYM full time (and giving “How to make fonduta” lessons on demand!). You'll hear more from here on these channels. A recent article on ReadWriteStart raised the issue of whether startup accelerators actually accelerate the path to success or not. All over the world nowadays there are more than 200 of these programs, large and small, known and unknown, all working toward the same goal of helping startups become successful companies. Are these accelerators a total debacle? Gilani mostly focuses on what he sees as a quality gap: a few quality accelerators at the top, and then dozens of mostly unknown programs below them. Will the program help me get additional funding? Will it help me develop partnership that can promote growth? Will it connect me with mentors that can truly increase my chances of success? Exits can take time. Did the study focus on a timeframe that is too short? Exits are not the only parameter for success. A startup that goes on to establish a profitable revenue stream cannot be counted as a failure for the accelerator and its founders. Even if the startup eventually fails, the people involved might have gained experience and skills that will lead to future successes. For-profit investors in the accelerator will certainly not count this as a success, but did the program really fail? An institution like the Kauffman Foundation - which commissioned Gilani’s study and is one of the main MTB supporters- might take a different, broader perspective and see the positive, long-term outcome as a success. Even if the startup eventually fails, without the support of the accelerator the entrepreneurs involved would not have been able to give their idea a try. Here too, for-profit investors in the accelerator will rightfully see the outcome as unsuccessful, but some of the entrepreneurs involved might see it differently, and the overall contribution to society as a whole is hard to gauge (e.g. will those entrepreneurs be more likely to “give back” down the road, if successful?). All in all, it seems that the perspective of the report was that of an investor in the accelerator. It’s clear, however, that overall success or failure goes beyond short-term financial gains. For some investors in startup accelerators, in fact, a short-term financial return is not the primary driver of the investment. Good reasons can be access to talent and to a relevant deal flow. Dimensions of success aside, there’s no question that startup entrepreneurs need to be careful when evaluating different acceleration programs. Here are some things to keep in mind in the selection process. Size of the seed funding: are you given enough money to quit your side job and give your idea a full try, at least for several months? The size of the seed also tells you a lot about how serious the accelerator really is about its program. Look for $50,000 in financing or above. Conditions attached to the seed funding: how much equity are you asked to give up, or what are the conditions attached to the convertible note? Seed funding with too many strings attached might substantially reduce your ability to obtain additional funding. Look for expert advice. Reputation and references: what’s the word on the street? And what do the alumni say? There’ll always be supporters and detractors, but a substantially negative “sentiment” (or complete lack of it) are a definite red flag. Do your research, from Facebook to alumni interviews. 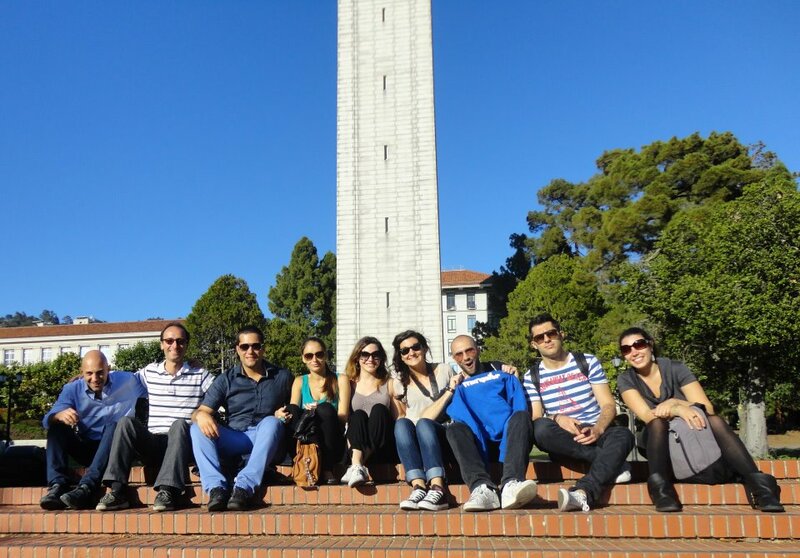 Mentoring community: can you recognize any of the mentors? Do you see people that have a skill set or industry experience that might be a good match for you? Can you talk to anyone to find out? Contact the accelerator to get a sense of how approachable the mentors really are. Success stories: in the end, we certainly agree with Mr. Gilani that a complete lack of success stories is a big red flag. What does the accelerator have to show for all the effort and work that it does (or doesn’t do)? Is Mind The Bridge a successful program? We certainly can’t write an article about startup accelerators without putting our own efforts at Mind The Bridge under the microscope. Truthfully, what we’ve done in the first 4 years of the program wasn’t a “fully baked” accelerator program (e.g. no major seed funding), but rather an education initiative with a mentoring program attached to it. That said, a tremendous amount of time and money has been spent making this program a reality, and – even more importantly – helping create unique success stories. Our business plan competition is indeed becoming a full-blown accelerator program (see the Seed Quest 2012 announcement). So, let’s look back at what we’ve done so far, glance at what’s head, and come up with a preliminary score card, based on the 5 points mentioned above. Size of the seed funding: only a few small investments here and there up to this point, but up to $65,000 of seed funding for the startups selected into the final phase of the 2012-2013 program. Now we’re talking! Conditions attached to the seed funding: the seed investment will follow the standard terms from the top notch programs in the world (either a convertible note with minimal terms and conditions or a minimum equity take). Reputation and references: our strong reputation in Italy has definitely helped many of the companies that went through the program raise their profile and obtain additional funding. Outside of Italy there’s certainly work to do, and we’re working on it. Mentoring community: we’ve got some great mentors, with a wide spectrum of areas of expertise and industry experience. Critics say that we need more non-Italians. Although some of these Italians have been outside of the old country for decades, it’s a fair criticism, and we’re working on that too. Success stories: well... here actually the track record is not bad at all. Especially considering point (1) above, the fact that many companies that passed through the MtB program went on to receive additional funding is certainly a success. Looking at the data, of the 15 companies we selected last year for the Venture Camp, 12 were able to get fund raising (1 in US and 11 in Italy) Some of the success cases include Timbuktu (admitted into the 500 Startups accelerator program after winning the 2011-12 MtB business plan competition), NextStyler, RisparmioSuper, StereoMood, Beintoo, Agroils Technologies, Mopapp, Arkimedial, Risparmio Super, Spreaker, and many others. We look forward to playing a role in the success of many other companies in 2012 and beyond! Last Thursday the MTB Italy Tour stopped in Genoa. Genova is a home of the Italian Institute of Technology (IIT), the new Technology Park "Erzelli" and a prestigious University: an enormous but highly unexploited potential for innovation. Our goal for this second stop of our Tour is Genova was simple: spread the message, as loud as possible, that building a company, create your own job is cool, heroic even. A mission fully shared by Francesco Oddone, Assessore Sviluppo Genova, Paola Girdinio, Dean of the Genoa Engineering School, Paolo Marenco (Silicon Valley Study tour), Renato Soru (Tiscali) and, last but not least, Maria Silva from Genova High Tech who successfully promoted and coordinated this event in Genova. In the morning panel, coordinated by Marco Marinucci, Renato Soru from Tiscali and Marco Salvadori from Cisco Systems shared their invaluable experience with the audience. In the afternoon, as usual, we run a Gym Session. Five selected startups were invited to present in front of investors and entrepreneurs with the goal of receiving constructive feedback. Genova High Tech sponsored a free entry to our Startup School in San Francisco to the most promising project. 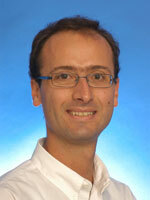 And the winner is... Emanuele Guglielmino, a team leader at IIT, with a background of electrical and control engineering and 13-years of research experience in big companies such as Westinghouse (UK) and General Electric and R&D Institutions. His project (called microturbine) is a patented coin-size high speed microturbine able to harvest energy exploiting airflow to produce electric energy with applications ranging from pipeline monitoring to web farm servers power supply back up. We think this idea has the potential to turn into a solid product that can successfully address global markets. MTB is going to give him the tools and skills to make it happen! We are not done yet... Next week we will land in Sicily. On June 29th MTB will be in Catania for the last date of our Italy Tour 2012. Principia SGR will be sponsoring a MTB School to the best presenting startup. If you are interested to send your business plan or to participate to the event, you are still in time to submit your application or register! More information here. Revolutions are exciting if you realize you are living them. Recently, we have been spending a lot of time talking and thinking about socio-economic crisis, job losses, frozen GDP and so on. In the meanwhile, a real gold mine is being built silently through the Internet. Gazillions of digital data is being created daily: logs, business transaction records, sensor and mobile device data, etc., reproducing digitally the real world in the fields of healthcare, energy, education, public administration, logistics, finance, tourism, etc. not to mention the emotions and life snapshots flowing through the social networks. The Internet acts as a mirror, able as it is to interact bidirectionally. On the one hand, it describes reality; on the other, it stimulates and influences it – and much faster than any other social transition previously experienced. A sort of parallel world is growing and this gives an unprecedented opportunity to analyze data, decipher and cross-mine them, finding emerging and recurrent patterns, discovering hidden behaviors. This will ignite a new wave of innovation, increased productivity and global growth as long as new professionals are available to dive into this ocean of data in order to extract potential valuable information and turn it into actionable wisdom. The McKinsey Global Institute (McKinsey Global Institute, Big data: The Next frontier for innovation, competition, and productivity) estimates that the “The United States alone faces a shortage of 140,000 to 190,000 people with deep analytical skills as well as 1.5 million managers and analysts to analyze big data and make decisions based on their findings”. The rest of the world is likely to face similar shortages and, in addition, the next big company will probably emerge in this field. Can you hear me? No job losses, no crisis, no gloomy scenarios: a gigantic, concrete, challenging job and business opportunity who might position those who grab it in a leadership position in the years to come, fostering growth and creating socio-economic value. Therefore, as a first step, TOP-IX (MTB long time partner) invited top-notch worldwide experts to talk about Big Data during its last conference at the end of 2011. Now Top-Ix gonna move a step forward: in collaboration with Axant , ISI Foundation and ToDo TOP-IX organizes in October a four-week training program called BIG DIVE , in order to boost the technical skills needed to dive into the big data universe. The goal is to nurture the growth of a new generation of developers. A street-fighting gym where high value datasets are the raw material in the hands of a bunch of ambitious smart geeks, tutored and mentored by experts in three key areas: Development, Visualization Design and Data Science. They are looking for brave divers, it's time to think BIG. Many great things have happened, since our inception 5 years ago. Today, it marks another critical step forward in our quest for the promotion and support of Italian Innovation in the world. Speaking of quest... today we are unveiling our brand new accelerator program (drum roll)... Seed Quest. Seed Quest is the natural evolution of our 5-year old business plan competition, now encompassing the sharp developments that have shaped the early startup world since we started: less focus on waterfall business planning more on early traction, more hands-on mentoring and, yes, a little seed funding to cover the expenses of a fully focused product development (that means no need to work on consulting services on the side to pay your bills, folks). Does that mean that we want to be a different animal then, from the "give back to the community" foundation that you've known? Not a single bit. Our hearth and soul remain the same. More than ever, we remain fully committed to our mission: providing support, inspiration and guidance for the new generations of Italian entrepreneurs. We are convinced, though, that we can do better to help develop more success stories. And only success is the real sugar that fuels the entire ecosystem. We can leverage Silicon Valley to help re-create the success of Glancee, Cacetech or Timbuktu. There is no other effective way to support longer term a startup than putting your money into it. And that's what we are going to do. We are committed to providing friendly terms to portfolio startups and we are working to line up more follow on investments from later stage investors. For the record, a good chunk of the potential returns from the investments (plenty! ), will go back to support the foundation activities, and help spread more entrepreneur-virus! It took us sometime to get here, but we are convinced that, with you, we can go a long way. As tradition, the MTB Italy Tour stops in Genova this summer, one of our favorite city (guess why :). When? On June 21st, save the date! Held at Camera di Commercio of Genova, this one-day event brings in Liguria a new culture of entrepreneurship, and gives to one startup the possibility to experience the Silicon Valley. 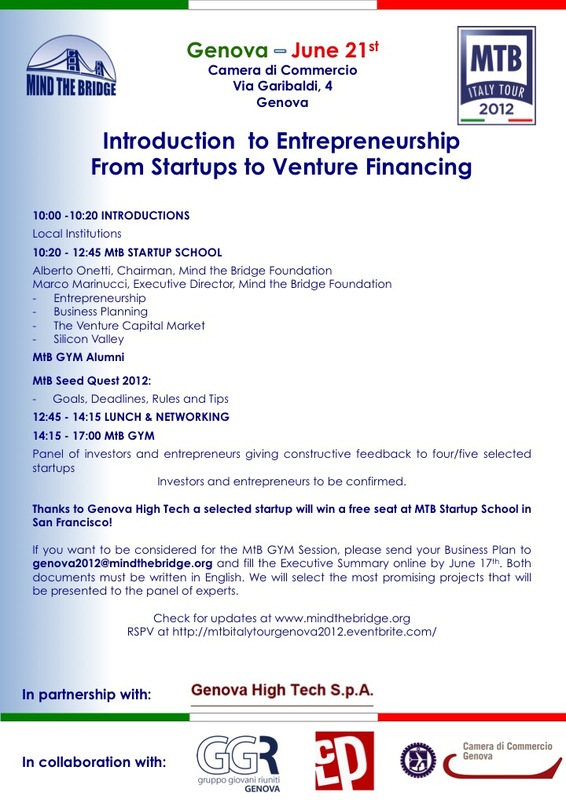 Indeed, thanks to the partnership with Genova High Tech - one of the more active actors of the local innovation ecosystem -, one of the startups selected to pitch at the afternoon Gym session will win a free seat and attend our Startup School in San Francisco! How to participate in the event and fly to Silicon Valley? 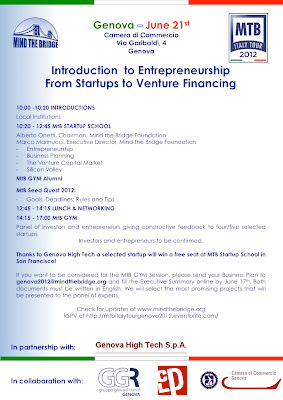 Send your Business Plan to genova2012@mindthebridge.org and fill the Executive Summary on line here by June 17th. You will be considered for our Gym Session and, if selected, you will present in front of a panel of investors and entrepreneurs. The best startup will win the MTB Startup School in San Francisco. The event starts at 10am. After the welcome speech, Marco Marinucci (MTB Executive Director) and Alberto Onetti (MTB Chairman) will present the "nuts and bolts" of building a startup and getting funded. In the afternoon experienced investors and entrepreneurs will give constructive feedback and advices to the startups admitted to present at the Gym Session. See the full program here and don't miss this opportunity! Participation is free but registration is mandatory (here the link).